What is the Bible? Can we really trust it? Many people today assume that the Bible is full of errors and contradictions. At best, it is a mildly interesting look at the lives and beliefs of people who lived centuries ago. While these assumptions may be common, they are wrong, as R.C. Sproul demonstrates in this Crucial Questions booklet. The reason is simple: the Bible is the Word of God. As such, it is trustworthy and authoritative, and what it says is of the utmost importance for every person. In this booklet, Dr. Sproul defines and defends the Bible as God’s unique special revelation to mankind and as worthy of our trust. Can I Trust the Bible? (2017) by R.C. Sproul was published by Reformation Trust Publishing in November 2017 and is our 35396th best seller. 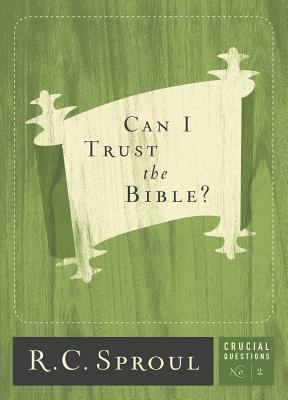 The ISBN for Can I Trust the Bible? (2017) is 9781567698497. Be the first to review Can I Trust the Bible? (2017)! Got a question? No problem! Just click here to ask us about Can I Trust the Bible? (2017).